What if a group of artists agreed to place their work outdoors in New York and San Francisco without revealing its exact location but left some clues? When Gema Alava asked nine other artists, some of them with current shows at major museums, to create an artwork so that she could hide it in public spaces, one might think these artists would wonder if there was an institution behind the project, a date for an official presentation or a curator who could help let people know about the new art pieces, which would be placed in San Francisco, Tenderloin District, and in New York City. Instead, the artists handed Alava their work and encouraged her to keep going. Artworks, in the form of installation, sculpture, painting, photography, an audio piece and an artist’s book, have been placed in June 2009 (in the Tenderloin District of San Francisco), and in September 2009 (in suitable locations in New York City). Detailed information about each hidden piece will be released during a one-time event at CUE Art Foundation, New York, with participant artists in attendance. In a globalized world where we can reach almost any place on earth digitally, have access to a great amount of information, and are surrounded by security systems which record our daily movements; could an artist leave behind artworks as she walks without being noticed? Alava holds a BFA from the Universidad Complutense, Madrid, and the Chelsea College of Art&Design, London, and a MFA from the San Francisco Art Institute, New Genres, 2000. She moved to New York in 2001, where she was admitted to the emerging programs: AIM-Bronx Museum of the Arts, and EMERGE-Aljira. Selected solo shows include the Diego Rivera Gallery at the San Francisco Art Institute, CA, and the Juan Carlos I Center at New York University, NY. Her work has been shown at the Queens Museum of Art, NY; Jersey City Museum, NJ: Bronx Museum of the Arts, NY; and Rana Museum in Norway. Her project A Dialogue took place at the Solomon R. Guggenheim Museum in 2008 thanks to Cai Guo-Qiang’s collaboration. She lives and works in New York City. Chellberg received a BFA from William James College, Allendale, Michigan, in 1986, and a MFA from the Cranbrook Academy of Art, Michigan, in 1992. His work has been shown at the Bronx Museum of Fine Arts, New York; Ssamzie Space, Seoul, Korea; Paradise Wood Sculpture Park, Santa Rosa, California; Titanik Gallery, Turku, Finland; Urban Institute For Contemporary Art, Grand Rapids, Michigan; and in outdoor projects such as Wonderland, San Francisco, curated by Lance Fung. In Insecta Magnifica (2002), Chellberg explored the complex relationship between people and insects by enlisting insects as collaborators. He lives in New York and teaches at Parsons School of Design, New York. Holub studied architecture at the University of Technology in Stuttgart. She co-founded “transparadiso” in 1999, a “platform for intended and non-calculated interventions between art, architecture, and urbanism with regular excursions to border zones.” Former President of Secession in Vienna, her projects, exhibitions, urban interventions and publications have been presented at the Eastside Projects, Birmingham; Austrian Cultural Forum, New York; Secession, Vienna; the International Symposium on Architecture, Valparaíso, Chile; the National Museum of Modern Art, Kyoto, and the Symposium Urban Drift, Berlin, among others. She lives and works in Vienna. Kos attended the San Francisco Art Institute, where he received his MFA in 1967, and has taught in the New Genres Department for 25 years. His work early on evolved in the direction of video and sculptural installations. Selected solo exhibitions and retrospectives of his work include the Berkeley Art Museum, California; the Grey Art Gallery at New York University and the San Diego Museum of Contemporary Art, California. His work has been shown at the Walker Art Center, Minneapolis; the Museum of Modern Art, New York; the Solomon S. Guggenheim Museum, New York; the Chicago Museum of Contemporary Art and the San Francisco Museum of Modern Art. He lives and works in San Francisco. Partegás holds a BFA from the Universitat de Barcelona and has completed postgraduate studies in Multimedia at Hochschule der Kunste, Berlin. Selected solo exhibitions of her work include the Aldrich Museum, Connecticut; Rice University Art Gallery, Houston, Texas; Museo Nacional Centro De Arte Reina Sofia, Madrid; CajaMadrid, Barcelona, and her work has been shown at the Weatherspoon Art Museum, Greensboro, North Carolina; the Walker’s Point Center for the Arts, Milwaukee, Wisconsin; Sculpture Center, New York; the Queens Museum of Art, New York; and the Whitney Museum of American Art at Altria, New York. She lives and works in New York City. Ryman made his first paintings in 1952 while working as a security guard at the Museum of Modern Art in New York. His first solo exhibition was held in 1967. 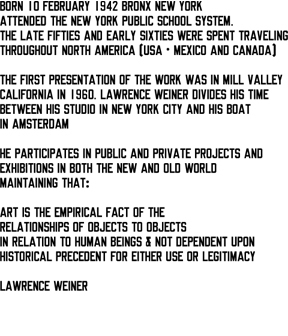 Selected solo exhibitions and retrospectives of his work include the Solomon R. Guggenheim Museum, New York; the Whitechapel Art Gallery, London; the Tate Gallery, London; the Museo Nacional Centro de Arte Reina Sofía, Madrid; the Museum of Modern Art, New York; the San Francisco Museum of Modern Art, California; and the Walker Art Center, Minneapolis. He is a recipient of a Skowhegan Medal for Painting, a Guggenheim Fellowship, among many other s awards, and is a member of the American Academy of Arts and Letters. He lives and works in New York City. Svenson is a photographer who has engaged himself and his audience in numerous serial projects and five published books of his work. Selected solo exhibitions include White Columns, NYC; the Grey Art Gallery at New York University, and the Laband Art Gallery, LMU, Los Angeles, CA. His work has been shown at SFMOMA, San Francisco, CA; the Andy Warhol Museum, Pittsburgh, PA; the Oxford Museum of Modern Art, Oxford, England; Museum Villa Stuck, Munich, Germany; the National Museum of Photography, Copenhagen, Denmark; PICA, Portland, OR; and the Mutter Museum, Philadelphia, PA. He has been the recipient of a James D. Phelan Art Award and a Nancy Graves Foundation for Visual Arts Grant. He lives and works in New York City. Yoon has been a New York resident for the last thirty years. She received a BFA from Cooper Union in 1994. In 2001 she began working on a multi-media performance series entitled Maria the Korean Bride designed to bring attention to the social pressure that Yoon endured as a first generation Korean-American unmarried woman. Her performances have been funded in part by the Pollock-Krasner Foundation, NYC Cultural Affairs, Asian Women Giving Circle and Franklin Furnace. She has performed at the Metropolitan Museum of Art and her work is included in major art collections including the Museum of Modern Art in New York. She lives and works in New York City. Wagner graduated from Sarah Lawrence College in 1957 and studied at the Art Students League in New York. Her paintings have been shown at the Islip Museum, Islip, New York; the Bronx Museum of the Arts, New York; the Center of Contemporary Art, Seattle; the Museum of Modern Art, New York; the Grey Art Gallery at New York University; P.S. 1, Long Island City, New York; Aldrich Museum of Contemporary Art, Ridgefield, CT; and is included in major art collections including the Whitney Museum of American Art in New York. She has been the recipient of a Hassam Purchase Award from the American Academy of Arts & Letters, and a National Endowment for the Arts Fellowship. She lives and works in New York City. Detailed information about each hidden piece, as well as their general location, will be released at 6PM with the participant artists in attendance. Be part of a gathering with artists of various backgrounds–from artists who don’t yet have gallery representation to artists who have had retrospectives of their work in major art museums. FIND ME’s PRESENTATION HAS BEEN MADE POSSIBLE IN PART THANKS TO THE SUPPORT OF CUE ART FOUNDATION, NEW YORK, AND ARTISTS ORGANIZED ART, INC.
Out of Volunteerism, 16 public works of art emerge from San Francisco’s Tenderloin neighborhood. San Francisco – The art exhibition Wonderland takes place in the Tenderloin neighborhood of San Francisco from October 17-November 15 2009. The exhibition encompasses 16 site-inspired projects set throughout the Tenderloin created by 53 artists from San Francisco and beyond. New York based curator Lance Fung created Wonderland to continue his exploration of collaboration, community and social exchange through the process of making contemporary art. Artists in Wonderland worked over the year with the Tenderloin community including nonprofits, religious organizations, schools, local arts associations and the public to develop their works of art. The themes in the artwork embody the full diversity that the Tenderloin offers and Proposal image by Offstage artist group include giving a voice to children shuttered by the environment, human trafficking, theater, homelessness, immigrant communities, local history and embracing the beauty of historic architecture. 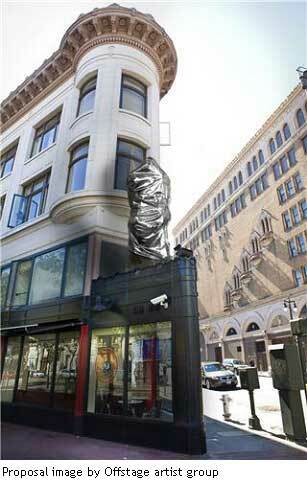 “I am both excited and anxious to see how the Tenderloin community responds to Wonderland. After working here for over a year with all of the existing arts organizations, not for profit agencies, business owners and community groups to discuss relevant issues to them and then balancing these thoughts with the creative and inquisitive nature of the participating artists, I hope the right balance has been met. The reassuring element of this collaborative effort is that these friends and partners in the Tenderloin feel so strongly about Wonderland that they hope to build upon it in the following year so the collective experience continues.” states curator Lance Fung. The entire event is based on volunteerism, from the curator to the artists and to the organizers, as the original budget for the entire event was less than $8,000. While the City of San Francisco’s Office of Economic and Workforce Development is contributing some logistical expenses, artists have partnered with local business owners, schools, and community organizations to make the exhibition happen. North of Market/Tenderloin Community Benefit District [NOM/TL CBD] is proudly organizing the event. Wonderland is now the signature event of NOM/TL CBD allowing for proper documentation of this new venture. A full color exhibition catalogue and 30 minute documentary will be created for Wonderland and paid for by the NOM/TL CBD. “The NOM/TL CBD has been so impressed, after some initial skepticism, with the evolution of Wonderland and the artists collaboration and integration with the community and neighborhood artists, that we have adopted Wonderland as our Signature Event. This allows for some infusion of funds to help sustain the project. Wonderland has so engaged the Tenderloin neighborhood that we are preparing and looking forward to Wonderland II.” The NOM/TL CBD has been instrumental in connecting Wonderland with a number of organizational agencies. Opening activities are scheduled for Saturday, October 17th in Boeddeker Park, located at the intersection of Eddy and Jones streets. Events include public performance, poetry readings, interactive activities for the children, and music. A detailed schedule of events will be available on our website however activities begin at 10 am and conclude by 6 pm. A symposium with the artists will be held on Sunday October 18, details online at wonderlandshow.org. The exhibition and all opening events are free and the public is encouraged to attend. Anthology is thrilled to present the U.S. Theatrical Premiere Run of artist and filmmaker Jeffrey Perkins, THE PAINTER SAM FRANCIS. Forty years in the making, THE PAINTER SAM FRANCIS is Mr. Perkins’s lyrical and intimate portrait of a friend, mentor, and leading light of American abstract art. The film retraces Francis’s life and career from his childhood in California to his artistic maturation in post-war Paris, his time spent in Japan, and his return to the United States. Hinging on an interview that Perkins conducted with Francis in 1973, as well as extended scenes of the artist at work in the studio, the film provides deep insight into a man for whom creativity was a powerful life-sustaining force. Interviews with friends, family, and fellow artists – including Ed Ruscha, James Turrell, Bruce Conner, Alfred Leslie, and others – illuminate a mysterious and complex personality, and its reflection in a body of work that is simultaneously diverse and singular. For Francis, art was a path to transcendence; for Perkins, Francis was art. The film is a labor of love, a moving portrait of a man, and a tribute to the power of art. “When Sam Francis said, ‘I paint time,’ this concept could very well have been the primary template for the making of this film. When one considers that I started filming Sam Francis in his studio in Santa Monica in 1968, and that the film was completed in 2008 – a forty-year life span – ‘time’ must be seen as the best possible metaphor to describe it. Friday, September 11 through Thursday, September 17 at 7:00 & 9:00 nightly. Additional screenings on Saturday and Sunday at 3:00 & 5:00.THE FILMMAKER WILL BE PRESENT ON OPENING NIGHT, SEPT. 11, FOR AN INTRO and Q&A SESSION at the 7pm and 9pm shows.